Two exceptionally floriferous orchids have been at their best during the holiday season: Masdevallia tovarensis and Dracula decussata. Masdevallia tovarensis has always flowered well for us during the short days of winter. Each flower spike produces 2-4 snow white flowers. In the Tropical High Elevation House this time of year it receives 50º nights and 72º days with 80% shade and near 80% humidity. Our plants came from Kalapana Tropicals. Masdevallia tovarensis is endemic to the coastal mountains of Venezuela where is grows at 1600 to 2400 m.
Dracula decussata doesn't produce the most dramatic flowers in the genus, but it can certainly create a tiny flower show all on it's own--with twenty or more flowers at a time. I love the whip-like red tails (sepals) that cross below the flower. 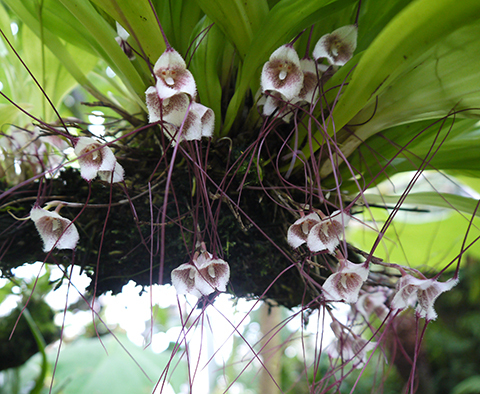 Dracula decussata comes from the Choco region of Colombia and grows at 1200 meters in the western cordillera. 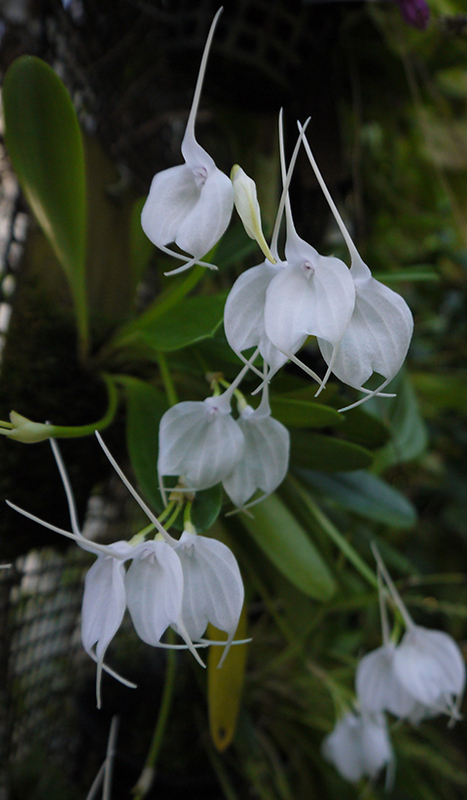 You can see both of these wonderful orchids in flower now in the Tropical High Elevation House.